Jack Butala: A little more about … I mean hopefully, in some ways a little more helpful. Jack Butala: You know, it’s just so important to look at what, you know, what went wrong and to learn from it. And fortunately we’ve created this environment where we theoretically can help one or two people. One or two people not make the same mistakes. Jill DeWit: A year? Or in life? Jack Butala: No. No, no. One or two people total, yeah. Really. Jill DeWit: Okay. I think we helped a little more than two. At the last count I got like four, not counting kids. Jack Butala: Oh, right. Right. Oh. Jill DeWit: Because we’ve ruined them. Jack Butala: I know that’s a … Our kids … Our Children have twice the responsibility that Jill and I have combined. Jill DeWit: Mm-hmm (affirmative). Wait, wait. Jack Butala: I can’t wait to see what happens to those kids. Jill DeWit: They have more responsibility than we do? Jill DeWit: Oh, that’s true. Jack Butala: Yeah, they take everything more seriously I think. It’s good. Jill DeWit: It’s a good thing. I agree. All right, Steve, I like this. This is a good topic, and I think you’re right that it’s important to know how the person behind the business maybe? I don’t know. Kind of how we got here, because you’re right, I think we can help some people. So I’m leading up to this. You go first, because I don’t want to go first. What do you think is your biggest mistake? Jill DeWit: You worked about your mistakes? Jack Butala: Turn the mics on and like did some thinking about this, so. Jack Butala: No, these … Without exception the biggest mistake I made in the real estate business and professionally was having a single point of sales venue in about … Up from like, I don’t know, 1999 to 2011. All right, let’s say 2003ish to 2011, our single point of sales for land was eBay. And, man, it worked great. And it still does work well, but, you know, there was a huge economics downturn that was tied to real estate back then. And, man, it almost sunk the ship. Jack Butala: So having a single point of sales venue, or a single point of failure really, it was a huge mistake. You know, we would have gotten through it fine and some of our competitors just got through it great. Jill DeWit: As one of the tools, not the only tool. Jack Butala: Yeah. Yes. Yeah, I got kind of lazy I guess. Jack Butala: So, yeah, that was a huge mistake. How about you? What was, you know, business wise, what was your biggest mistake? Jill DeWit: Well, you know, I kind of … Mine’s kind of all one big thing. I don’t … It’s really getting hung up in the corporate world. Jack Butala: Well let me guess. Your parents told you. Jill DeWit: Oh, well that too. Yes. Jack Butala: I’m not knocking your parents, it’s everybody’s parents, you know. I’m from Detroit and unless you work, you know, in middle management Ford or General Motors, this is back then, you’re like nobody. Jill DeWit: Mm-hmm (affirmative). You’re supposed to do that. Jill DeWit: You’re supposed to get a job like that. Jill DeWit: And you’re supposed to stay there forever and retire there. You know, and I’m not knocking it, because for some people it’s great, that’s what they want to do. For me that wasn’t really what I want to do and I was kind of … I felt stuck and trapped and we all laughed about the golden handcuffs, you know. I had the seniority, I could get the holiday, you work so hard to get the what I thought was good pay, and … At least for that environment it was. And to get the time and, you know, all that stuff. And then I thought, “Well, I can’t leave.” And, so, you know, it was pretty darn scary when I left, and … But I did. Jack Butala: I didn’t know you back then. Did you have a side business going? Or what … Did you have like some kind of vision about how you thought you wanted it to go? Jill DeWit: Nope. I just was … I was pretty much fed up. And in one month I had a monumental birthday, I had left American Airlines, I moved to another town. Kind of reset, started over, everything fell into place and I never looked back. And it was awesome. Jack Butala: All right. This is completely off the topic of the show, but I know you and I’ve talked about it, because you want to do a show about this. What would you tell a young woman, who’s I don’t know, in her early twenties, mid-twenties, who, you know, she’s headed down the same path, or she thinks she knows that she wants all this stuff, but what would you tell her? What would be the open ended advice you’d give her? Jack Butala: Well, who’s laughing all the way to the bank now, Jill? Jill DeWit: You know, I kind of … I never wanted a 9 to 5. I wanted to be able to be my own boss, set my own schedule, travel the world, you know, and not have to be tied down to different things. And I didn’t think that was kind of possible. I thought that was only stuff you could do on your vacation time. You know, seriously. Jack Butala: Yeah, you get caught up in that. Jill DeWit: You do. Well you can’t write a book, you can’t do this, you know? It’s kind of like that’s for other people. Some of it we put on ourselves too. So that’s … I think a lot of the restrictions I did put on myself. I did not have the confidence for whatever reason. So I would tell a young woman in my situation that what … Or just any young woman. You know, whatever it is you think you want to do, don’t listen to anybody else, just go for it. You know? Jill DeWit: Don’t let anybody tell you you can’t. And that’s one of the things I come back too, we all love that book, “Rich Dad Poor Dad”. And that’s one of the things that I took away from that book was, you know, whatever it is you want, you can have it, you just got to figure out a way. Don’t let anybody tell you you can’t have it. You just got to figure out a way. And that’s it. Jack Butala: Okay. I’m going to be the advocate here. Is that all right? Jill DeWit: Oh, totally. Am I going off topic? Because I was like blabbering here? Jack Butala: No. No. We could get back. Jack Butala: I’ll bring it back in. Not at all. Jack Butala: Not at all. Because I think this is actually, if it’s got the potential to help one person, then I think, no, we’re not off topic. Jack Butala: I think when I hear people say stuff like, “You can be whatever you want to be.” And they usually have like a crystal hanging around their neck, and, you know, long white hair and they’re like a shaman in a different country. It makes me a little like, “Come on, man.” You know? Jill DeWit: All right. All right, all right. Jack Butala: And I’m not criticizing you at all. 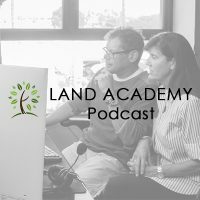 I think what people really want to hear, and I think most of our Land Academy members, they want some freaking advice. They want some like, “No, no, no. Go over here and do this. Do this, this and this. And if you don’t read very well or if you’re bad at math, then this might be better for you.” I think that more instruction from somebody who has some credibility is better than just like some theoretical points. Jill DeWit: Yeah, I know you’ll laugh, because I use this one all the time. What if I want to be a jockey, but I’m seven foot tall? Jack Butala: I love it. Or a three hundred pound ballerina? Jill DeWit: Right. I don’t think that being a jockey, or a ballerina really might make sense. I don’t think so. Jack Butala: Thank you. That’s what I’m after. Jill DeWit: And so you have to be realistic. There’s all kinds of parts to this. So what do you really want to do? Is it realistic? Now let’s figure out a plan. And to go with what you said, I completely agree. I’m a huge fan of finding someone as a mentor in whatever it is you want to be. Most people I know are flattered. I would be so flattered if I got a phone call tomorrow from someone who said, “Jill, I want to be you. I love your lifestyle, I love what you guys have going on. I want to do this. Can you kind of, gosh, guide me a little bit?” I would be so darned flattered, and I would say, you know, “Yeah.” Kind of say, “Here’s some places that I made some mistakes, don’t do that. Here’s a better way to do what I did here.” And all this stuff. And just guide them so that ties in to what you said. Jack Butala: If you’re that young woman, Jill’s email address is, jill@landacademy.com. Jack Butala: If you’re that twenty year-old … You’re in a lot .. You know what I got on notice from GoDaddy, where we host all our stuff? Including email. Jack Butala: That we have exceeded our resources on both of the main websites, on Success Plant and Land Academy. Jack Butala: We’re starting to get charged a lot. Jill DeWit: It’s blowing up our stuff. Jack Butala: The whole thing planned. Jill DeWit: The unlimited data hook? Jill DeWit: Or, “Are you going to pay for it?” Well, we’ll pay for it. Jack Butala: Anyway, we’re going to get a notice that you’re email’s overloaded. Jill DeWit: Here it comes. Jill DeWit: My email keeps getting blown up anyway from stuff like that. So, yeah, don’t worry about it. Jack Butala: So, no, I think any young woman would be, you know, lucky. Jack Butala: To be exposed to what you do everyday. Jill DeWit: Well that’s coming, by the way. Jill DeWit: So what about you? Give me some more stuff for you. What’s another mistake that you made? Jack Butala: Well, just to briefly address the corporate thing. Because I think a lot of people are listening, saying, “Man, I need to do something else.” And they’re stuck in the corporate cog. Every corporate job I had, right from out of college, you know, and it’s all the … Both of our resumes are on our LinkedIn, you can go see what we did. Jack Butala: You know, I made partner at KPMG and the whole time I was there, and the jobs that … Other big trading company jobs I had before that, they were … Everyday I got up, I knew that was just a stepping stone. I knew I would have my own thing one day. Jack Butala: You know, I never was trying to really go the distance or, you know, play that game. I was just there to collect the paycheck and learn so I could do my own thing at some point, and I did. Jill DeWit: That’s good. So, you know, well that means the whole time that you were there, it was with … for a purpose? Jack Butala: Yes, to learn. Jill DeWit: Right. And you would probably align yourself with the cool people that you really wanted to learn from. Jill DeWit: And so you were probably getting a lot out of it. That’s smart. Jack Butala: You know, when you’re in public accounting, or consulting, I was in the consulting area for accounting. Or any just generally in a big corporation, you have all these clients and, so, when you work there, day in and day out, you’re getting job offers from the clients that you’re actually serving under the name of whatever. In my case it was KPMG, or the companies that I worked. And I never took any of those jobs, you know? Because I just kind of knew it was going to be over, so. Jack Butala: You know, for some people that’s just a dream come true. It’s like you get a new job, you get a new job, you get a new job. Each time you’re getting pretty good pay increase. Jill DeWit: Bump up in pay and … Right. Jill DeWit: Or, you know, I’m sure there’s a lot of people too that, it’s just this is just a nice side breathing room business. This might just be something to make sure I don’t have to worry about paying for the kids college. Jill DeWit: Or we can afford to take the trips we really want to take. And I can boost up my retirement and I just have breathing room. Jill DeWit: So you could be doing this for all … Be an investor for many, many different types of reasons. You know, so. Jack Butala: Right. Yeah, the second biggest mistake … Is it my turn or yours? Jack Butala: Well, another huge mistake that I made, and this is more personal than business, is spending a tremendous amount of money on a primary residence. You know, as you know, I bought a huge house. You know, this was whatever, I don’t know how many years ago. Jill DeWit: With a guest house. Jack Butala: With a guest house. Jill DeWit: Which you ended up living in, so that wasn’t a bad thing. Jack Butala: That was the best part of that actually. It was like I was sixteen. You know, I had my own driveway and my own garage and my own stereo. Anyway. Jack Butala: My point is the financial piece of this is that, you know … Gosh, I really did a spreadsheet one time. I did a blog on this. How much money, time and energy I wasted on that house was ridiculous. Renovation costs, and interest expense, and landscaping costs, and the pool expense and on and on and on, it was ridiculous. So, you know. It cracks me up. The blog that I did on it was, you know, you think you’re making money on your primary residence, but really when you do all the math, you’re breaking even at best and you’re probably losing money. I lost well over half a million dollars on that deal. And I lived there for … And if I would have rented out an apartment, I would have lost no money. Jack Butala: In a mortgage free rent, free like situation that’s just … Well, that just is … It makes for a good sleeping. Jack Butala: All right. Your turn. Jack Butala: I do. You’re nothing like that now. Jack Butala: And I mean it. Jack Butala: You know, some women are really bad with money. You hear these stories. You are not one of those people, I mean it. Jack Butala: You are a very … And I’m not … And it’s not a female specific thing, but I’m just saying that, you’re very good with money. Jack Butala: So give us some gory details. What did you buy? What did you spend? Like twenty-five thousand bucks and put it on a credit card on something that … Yeah, give us like, you know? Jill DeWit: Oh, shoot. I wish I had something good like that. No, just like a brand new vehicle. And now you know I will never buy a brand new vehicle, by the way. I will never finance a vehicle, by the way. Back then the vehicle that I bought was around thirty thousand dollars, which at the time for us was a lot of money. And I remember the payments were, gosh, I want to say four hundred dollars a month. And now people are spending like … I’m hearing people with seven, eight hundred dollar a month car payments. Seriously. This is not inc … Remember Larry the Cadillac guy? Jack Butala: That’s insane. Yes. Yes. Jill DeWit: Yeah, our friend. I’m like, he was telling … Wasn’t it like an eight hundred dollar car payment? Jack Butala: Then you got insurance on top of that. Jack Butala: So you’re spending a thousand bucks a month on a car. Jill DeWit: On a car.